Rossland Garden Dental Office in Whitby provides patients with educational information regarding diet and dental disease. The mouth is a part of a person’s food processing mechanism and as such is influenced by the food we eat. Primarily, the structures in the mouth are influenced during their formation by the nutrients that reach them via the blood supply and later on when they come in direct contact with food and their derivatives. The cells of the oral structures, like similar cells elsewhere in the body, are in a constant state of repair and regeneration which requires an adequate supply of nutrients provided by a balanced diet. Therefore, the vulnerability to oral disease is related to factors like age, income and education although oral hygiene plays a significant role in periodontal disease. Fibrous foods are better than sticky foods as they not only replace the empty calorie in the sugar rich sweets but also promote gingival health as they stimulate and strengthen the gums and increase salivation and clearance of food debris. 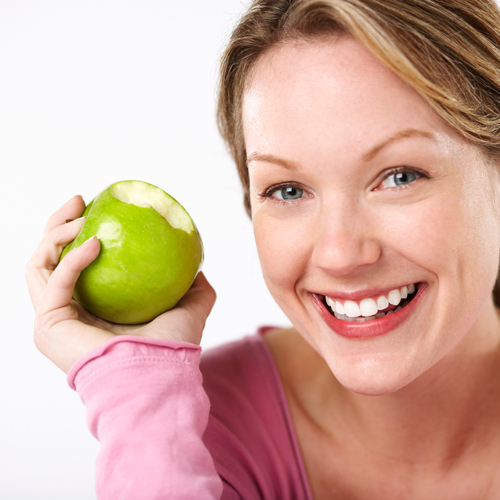 Nutrition affects the individual’s susceptibility to dental decay. Fluoride deficiency during the formation of tooth structure increases the chances of cavities, later on, especially when these teeth are subjected to a diet rich in sugar to form acids which cause the demineralization of the enamel giving rise to decay. A few things to remember about snacking is to snack nutritiously, for example wholesome milk, cheese, fruits, vegetables, breads, cereals, meats and nuts. Limit the number of snacks per day, especially in children, snacking should be used only when hungry and not as entertainment. Also, it's a good idea to change the snacking menu daily with a wide variety of nutritious foods containing minerals and vitamins not sugar or fat. Foods like raw vegetables, nuts, popcorn, meats, fish, poultry, aged cheeses, are preferable to carbohydrates like sugars and starches which are healthy if eaten in combination with other wholesome foods and not alone.